In this delightful world of hula-hooping, rock skipping and "Double Dog Dare-You's", jam-packed with simple pleasures and family values, you will come away with a trio of new best friends and an appreciation for the simple life. Penelope's stories will inspire you, delight you and keep you laughing all the while. The Penelope Desiree Montclair Series! If you want to read some pages from my book, go ahead and take a peek. Just click on a page. 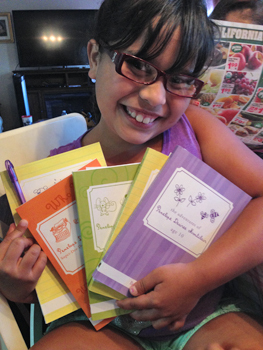 Penelope's books are available through Barnesandnoble.com, Amazon.com or in our General Store. I liked Penelope. It made me laugh. I hope the author keeps writing more books so I can read about Penelope's new baby cousin. I liked the book mostly because of all of the challenges Penelope has to overcome and she learned a lot of very important life lessons. I work in an elementary school and brought Penelope, Age 10 to read to the third, fourth and fifth grades one day. Let me tell you, it was the most fun we had. The kids were laughing and were so involved. When reading time was over, the kids in each group begged me to keep reading. When we finished the book, they all wanted me to start over again. We loved it. Gwen, soon to be 9 years old, loving Penelope's books. All the girls in my book club enjoyed your fun book. We can't wait to read more of them. I was reading Penelope Age 10 while waiting for my son after a school event. I was laughing so hard that all of the other parents kept looking at me. I cannot wait to finish! Your book encouraged me to write a journal. I loved it. My mom suffers from Alzheimers and is in a small assisted living home. Whenever I visit her, I pull out one of your books to read to her. When other residents and even employees hear me read, they come over and listen in. Everyone enjoys hearing Penelope's stories. I look forward to sharing them with my grandchildren when they get older. My daughter has a difficult time reading and does not enjoy it – until now, thanks to Penelope. I gave her a copy of your book and for the first time in her life, she sat down and read for hours. She was laughing and enjoying it. Now I don't even have to ask her to read. Every time we go shopping, the first place she wants to head to is the book section. Your books are really great. I like how your books relate so much to real life. Fifth grade girls can really relate. My daughter and I are in a mother-daughter book club. We just finished reading Penelope Age 10. I grew up in Virginia and my dad worked at the mill and I had a simple life like Penelope. I could definitely relate and enjoyed the book tremendously! When will your next book come out? I read Penelope's book again. I always get so happy when I read her stories. I hope you are writing another. I picked up two of your books to share with my eleven year old twin granddaughters. We read one diary entry at a time and discuss it. We tell each other our own stories that relate to that entry. It has brought us closer and allowed my girls to confide in me and get to know me better. We all love our Penelope time. Penelope's books are so awesome!